Pebbled Collection 10 1/4" Pearl Banquet Plates with Pebbled Border 10ct. Pebbled Collection 9" Pearl Luncheon Plates with Pebbled Border 10ct. 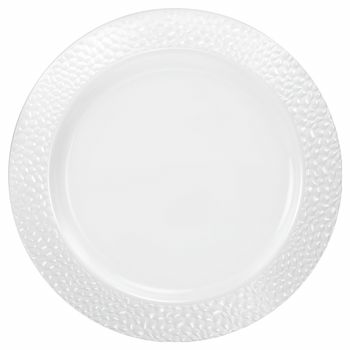 Pebbled Collection 7.5" Pearl Salad/Dessert Plates with Pebbled Border 10ct. Pebbled Collection 14oz. Pearl Soup Bowls with Pebbled Border 10ct. Pebbled Collection 5oz. Pearl Dessert Bowls with Pebbled Border 10ct. Pebbled Collection 7oz. Pearl Oval Bowls with Pebbled Border 10ct. Pebbled Collection 32oz. Pearl Oval Bowls with Pebbled Border 3ct.